India managed to level the T20 international series 1-1 with a clinical victory over the Kiwis. 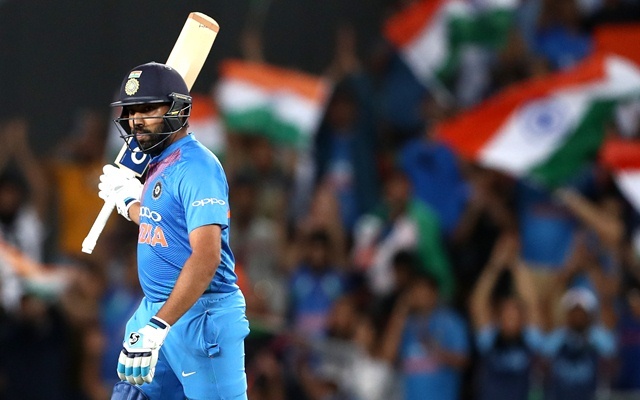 Rohit Sharma led from the front with a fascinating knock of 50 runs from 29 balls as India chased the target comfortably. Captaining the team in Virat Kohli‘s absence, Rohit did a wonderful job handling the pressure. He also equalled Kohli’s captaincy record in T20Is as the visitors registered their 12th win under him in the format. The 31-year-old reached a number of milestones with his knock against the Black Caps. Rohit is now the highest run-getter in T20 internationals as he left behind Martin Guptill in the list. The Indian opener is the only cricketer to have registered four hundreds in the shortest format. However, there’s another elite list which witnessed Rohit’s entry. During the course of today’s knock, Rohit Sharma went on to hit four maximums. In the process, the Mumbai lad also completed 100 sixes in T20 Internationals. He also pipped MS Dhoni to hold the record for most sixes by an Indian in international cricket. The Mumbai lad now has 349 sixes, just one above Dhoni. Overall, he stands fifth in the list. Shahid Afridi and Chris Gayle jointly head the coveted list with a total of 476 sixes each. Since Afridi is done with international cricket, Gayle in all probability may become the lone record holder. Both are followed by Kiwi’s Brendon McCullum at 398 sixes. Sri Lanka’s explosive opener Sanath Jayasuriya is fourth with 352 sixes. 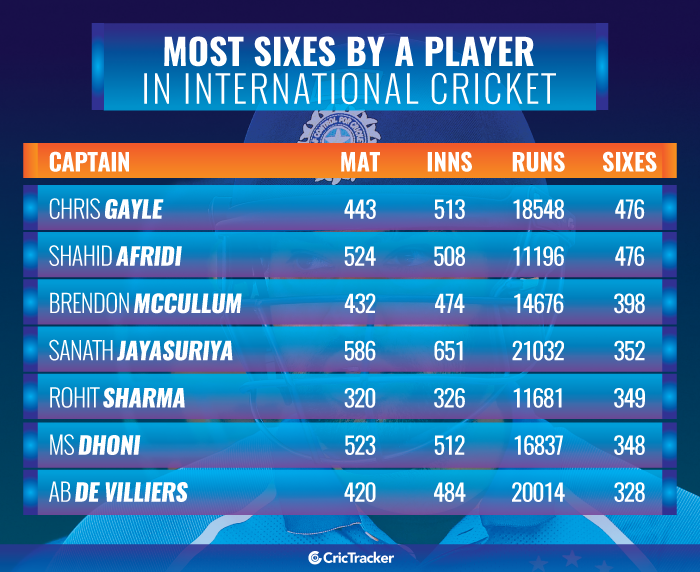 AB de Villiers and MS Dhoni are sixth and seventh in the list. While the South African smashed 328 maximums during his illustrious career, the Indian veteran has 348 sixes to his name. Dhoni is still going strong and can add a few more to his kitty before hanging his boots later this year.